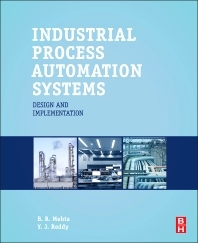 Industrial Process Automation Systems: Design and Implementation is a clear guide to the practicalities of modern industrial automation systems. Bridging the gap between theory and technician-level coverage, it offers a pragmatic approach to the subject based on industrial experience, taking in the latest technologies and professional practices. Its comprehensive coverage of concepts and applications provides engineers with the knowledge they need before referring to vendor documentation, while clear guidelines for implementing process control options and worked examples of deployments translate theory into practice with ease. This book is an ideal introduction to the subject for junior level professionals as well as being an essential reference for more experienced practitioners. Provides knowledge of the different systems available and their applications, enabling engineers to design automation solutions to solve real industry problems. Includes case studies and practical information on key items that need to be considered when procuring automation systems. Practicing automation design and maintenance engineers, junior level engineers from instrumentation, electrical, chemical and production. Students at PG level for Control and Instrumentation, Process Automation, Chemical Engineering in chemical, petrochemical, power, metals, mining and pharmaceutical industries. 5.2. What is functional safety? B.R.Mehta is Senior Vice President with Reliance Industries Ltd., Mumbai. He has over 41 years’ experience in the refinery and petrochemicals industry. He has worked on control systems and instrumentation engineering projects for Patalganga, Hazira, and Jamnagar Refinery & Petrochemicals during his 22+ years with Reliance Industries. Prior to joining Reliance, he worked for Agro-Chemical & Food Co., Kenya as Chief Instrumentation Engineer and for Indian Petrochemicals Ltd., Vadodara for 11 years as Instrument Engineer. He is currently heading the design & engineering department for control systems & instrumentation. During his career he has worked with many overseas licensors, including U.O.P, Foster Wheeler , ICI, Union Carbide , Du Pont , Stork and Stone & Webster. He has also worked with engineering contractors Bechtel, John Brown , Lummus , Jecobs H & G , Lucky Engineering, Chemtex , Worley, and Aker Kvaerne. He has worked on basic engineering, detailed engineering, procurement, inspection, expediting, construction, testing, pre-commissioning & commissioning of various petrochemicals, chemicals, co-generation power & refinery projects from concept to Commissioning. Dr. Y. Jaganmohan Reddy, has 18 years of experience in the field of industrial automation and control as a Senior Architect, Systems engineer, Project engineer, Test engineer, Maintenance engineer, and has also worked for Pre and Post sales support in industrial instrumentation, control and automation solutions. He graduated with a degree in Electronics and Instrumentation Engineering in 1997 from Kakatiya Institute of Technology and Sciences, Kakatiya University, Warangal and has a Masters in Software Systems in 2004 from Birla Institute of Technology and Sciences, Pilani, and got his Ph.D. in Electronics and Communication Engineering from JNTUK, Kakinada. Earlier in his career he worked for JOCIL Ltd, a subsidiary of The Andhra Sugars Limited as an engineer (Instrumentation), responsible for maintenance and project activities of the instrumentation and Control Engineering. He is currently working as a senior architect in Natural Gas Measurement and Monitoring Systems in HTS Lab Pvt. Ltd, Hyderabad. Dr Reddy has published 26 research papers in various International/National journals and conferences and has authored two books on microgrids. He is a member of ISA, IETE and a Certified Automation Professional (CAP) and Systems Engineering Professional, and his research areas include Industrial automation, Power systems, Energy management systems, Instrumentation, and control systems. Senior Architect at Honeywell Technology Solutions Lab, Hyderabad Area, India, and International Society of Automation (ISA) Certified Automation Professional (CAP).